Private released CDR of beautiful solo piano arrangements of some of Makucevich's favorite Radio Piece III tunes. Many of these selections remain unreleased in any other form and so this is essential for Radio Piece II fans. One track is from the ZNR release "Tesseract & Monuments" and one track from the extremely rare debut vinyl-only release just called "Radio Piece III". There are two selections that have only been "officially" released on a cassette-only opus entitled "Tomato Pie Blues". The remaining seven selections haven't been - as far as I know - made available in the original RP3 recordings. This is a nice CDR with a label that goes all the way to the hole and a professional insert & tray card. For RPIII fans this is essential. For those who like a nice solo piano recording it isn't even necessary to know the band at all to really enjoy this CD. 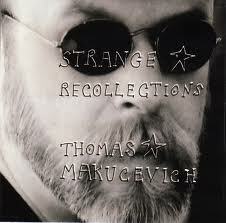 Notify me of updates to Thomas Makucevich "Strange Recollections"